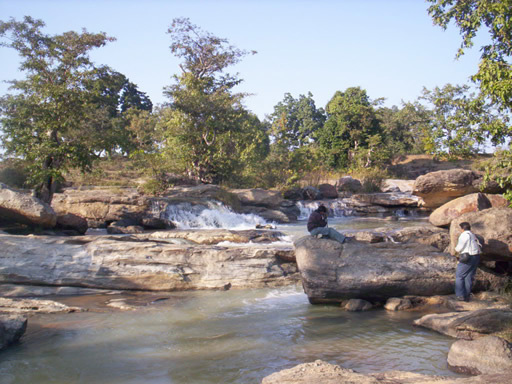 SABKAKALYAN: Tourist spot of Jharkhand Betla national park,pride of palamau. Tourist spot of Jharkhand Betla national park,pride of palamau. Betla national park s pride of Palamau.Situated in the districts of Palamau and Latehar Sanctuary is spread over an area of 979sq.km. The core area of 232 sq. km of the sanctuary was declared as Betla National park in September1989. The park occupies the western parts of the Chotanagpur plateau and was constituted in the year 1960 as an extension of the Hazaribagh National park. Palamau has the distinction of being the forest where the world's first tiger census was enumerated in 1932. The park became one of the earliest 9 tiger reserves in India under 'Project Tiger' in 1974. The forests of the park have a vast range of vegetation consisting of tropical wet evergreen forests in the lower reaches, mixed (moist & dry) deciduous forests in the middle and temperate alpine forests in the upper reaches including Sal and bamboo as the major components along with a number of medicinal plants like palash,guliachi . The river north Koel and its tributaries Ornga run through the northern portion of the park. There are grasslands in the river flowing area. It has waterfalls and hot springs in satbarwa and mirchaiya fall. 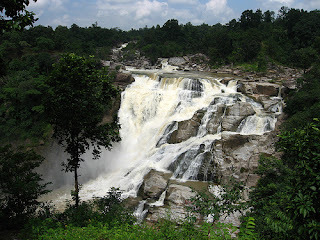 One can also visit 468 –ft high Lodh Falls situated 95 km south of the park in Mahuadar and ruins of the Chero Kings’ Fort situated near the Betla at 400 ft (120 m). Once the seat of Chero kings, there are two historical forts, one of them belonging to the 16th century deep inside the forest. The main sentinel of the old fort is visible high up on the hill with defences in three directions and three main gates. The diversity of Eco-system promotes a wide variety of fauna consisting of elephant, panther, leopard, wild boar, tiger, gaur, sloth bear, sambar, chital, nuntjac, nilgai, langur, mouse deer, monkeys, small Indian civet, mongoose, jackals, porcupine, ant eating pangolin etc. Elephants in large numbers are seen mostly during the monsoons up to the time when water sources begin to dry up in March. Jackal and hyena are common scavengers. Bird-life is rich featuring the hornbill, peafowl, red jungle fowl, black partridge, white necked stork, black ibis, swamp grey, quail, the pied born bill, wagtails, the harial, doves, drongo, the crested serpent-eagle, forest owls, the papiha and other birds usually found in dry deciduous forests. The famous Kamaldah lake attracts several varieties of water birds including the common whistling and cotton teal, the comb duck, snipe and geese. The rhesus monkey and the common languor provide attraction to children visiting the park. October to May, open through out the year. The accommodation facilities in the tourist complex, include a three star hotel, tourist lodges with canteen, log huts and tree houses inside the forest with fully furnished suites. 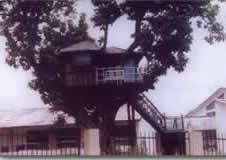 The tree house overlooks a watering hole a few yards away where the animals gather in the summers to quench their thirst. STD/ ISD, Postal and Internet facilities are available in the reserve area. Jharkhand State Tourism Development Corporation's Van Vihar is available for stay. Phone: 06562-286513. Palamau district site shows following amenities. Besides there is Jharkhand State Tourism Devlopment Hotel ( Van Vihar) having 2 A.C. rooms, 1 Double bedded tree house, 7 deluxe rooms, 16 economy rooms, 4 three bedded Dormatry, 1 eight bedded dormatry, 2 five bedded dormatry and two other private hotels Debjani & Naihar , having 16 & 7 rooms respectively besides 2 dormatry of 10 bed & 5 bed capacity respectively. 1. No entry after sunset & before sunrise. Night driving is prohibited in the reserve. 2. Pets, transistors, tape-recorder, stereos are not permitted. 3. No arms and ammunitions are allowed. 4. Carelessly throwing & leaving trash litter are strictly prohibited. 5. Candling fire in the forest is prohibited. 6. Fast driving (> 20 km. Per hour) & blowing of horn is strictly prohibited. 7. Shouting, teasing or chasing of animals are prohibited. 8. Hunting and fishing are strictly prohibited. 9. Staying in rest house without reservation are prohibited. 10. Use of flash camera to take a snap of wild animals are not allowed. Interpretation & Conservation Education :- There is one Nature Interpretation Center (NIC), at Betla. This is an excellent creation, consists of reception, displays of models, Museum, Library and auditorium. This NIC remains open for the visitors daily from 10.00 am to 5.00 pm. Three staffs are deputed to take care of tourists & NIC. Two visitor’s book(1 VIP and 1 general) are maintained in NIC to get the visitor’s feed back & to access the no. of visitors. 16 mm films and videos film on wild life are also shown in the auditorium. However with condition of law and order it would be better to stay at Daltonganj or in fix ban-glow of forest dept.Besides forest it also offer study of tribal life style and culture. Can you please provide phone number to book room in rest house? Good Blog with good Pictures, i really like it.We provides Tempo Traveller in Delhi ,Tempo Traveller in Gurgaon , Tempo Traveller on rent in Noida , Tempo Traveller on rent in Ghaziabad , Tempo Traveller on rent in Faridabad , Tempo Traveller,Tempo Traveller rent faridabad,Tempo Traveller on rent in gurgaon,Tempo Traveller hire Ghaziabad,Tempo Traveller rental faridabad,Tempo Traveller on rent in noida ,Tempo Traveller on rent in Ghaziabad for easy travel. Copyright rajeev ranjan tiwari. Watermark theme. Theme images by ImagesbyTrista. Powered by Blogger.